Dont pay a lot for your filters .....$89.00....NO!....$65.00!!! ...NO NO $35.00 ...NO!! $25.00 NO!!!!! 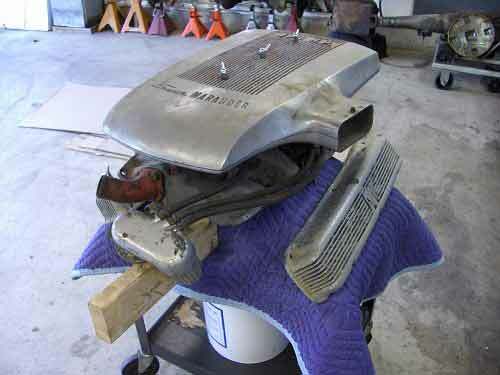 Check out the site....Super Marauder Air filter IN STOCK!!! Now you tell us! I paid $30. And it will be years before I need another. 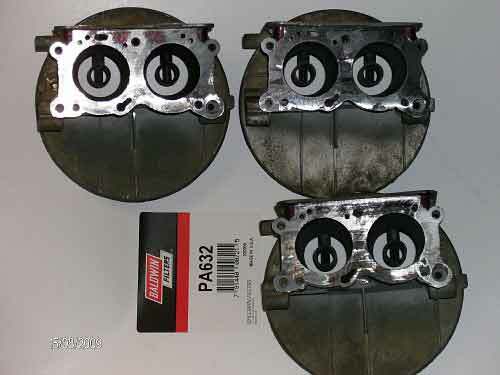 Also consider the "Part #" section for posts regarding shopping recommendations and part numbers. I needed to machine new insulating spacers for a 3 x 2 setup. The old material looks like a brown Bakelite ..It was deteriorated. Notice the locating pins .....No magic here. 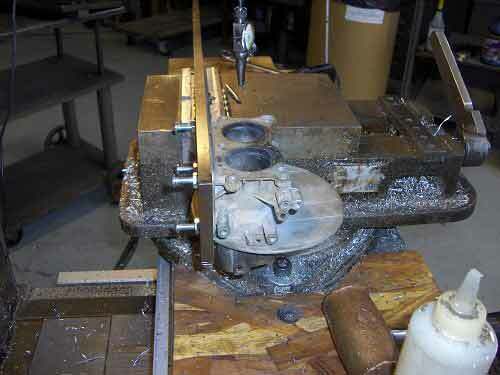 Drill press and band saw. 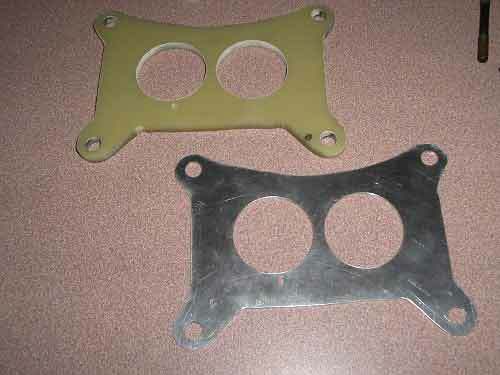 Also three new Stainless studs for the air cleaner. Last edited by 59lincolnrag on Sat 15. Aug 2009, 17:30, edited 2 times in total. Anthony, why are you sandwiching those aluminum plates? Is that the way they used to roll off the line? I sure do miss s.th. We simply stacked all the materials to cut out everything at once…. So ….for better Insulating qualities. So I’m really only adding a thin Aluminum plate to each one. Since our Gasoline seems to evaporate very quickly this seems like a reasonable “fix”. Last edited by 59lincolnrag on Sat 15. Aug 2009, 17:31, edited 1 time in total. 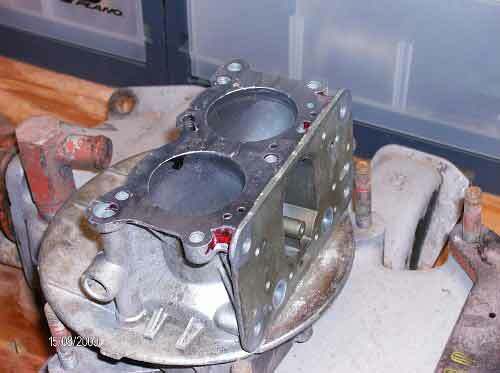 So you think that the additional aluminum spacers will add to cool the carb? I allways thought that the Gsk. Sp. Gsk. stack was good enough in my car. But hey there ain't no too much cooling as allways in this case. 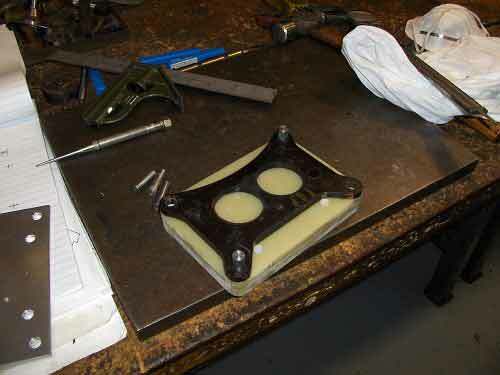 The old factory castings Need to be milled true and flat. 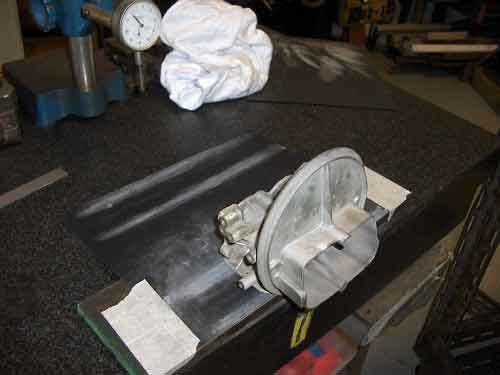 Using a surface plate and 320 grit wet/dry paper carefully sand flat the fuel bowl surface flat. Using a heavy piece of tool steel I made a Fixture to hold the Carburetor body from the true fuel bowl surface at 90 degrees. 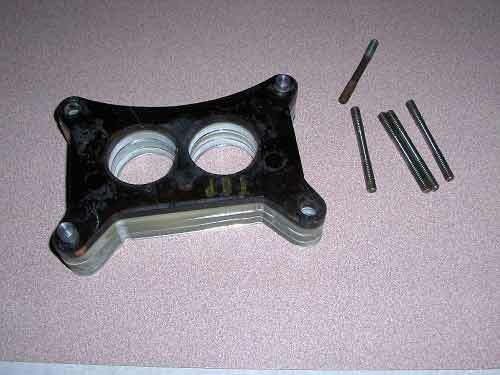 Notice the back side gasket surface ......its all blackened ......No wonder the car did not run right. After “bluing” the surface bring down the end mill to with in a few thousandths represented by the piece of paper. 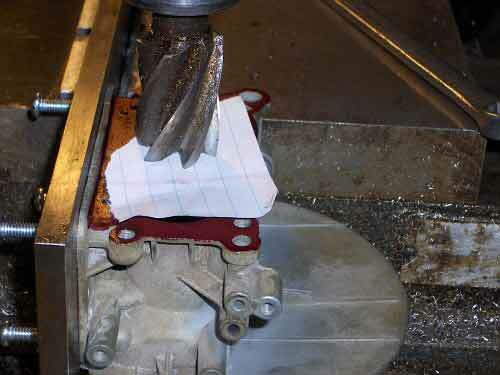 You just want to mill down to get the mating surface flat. 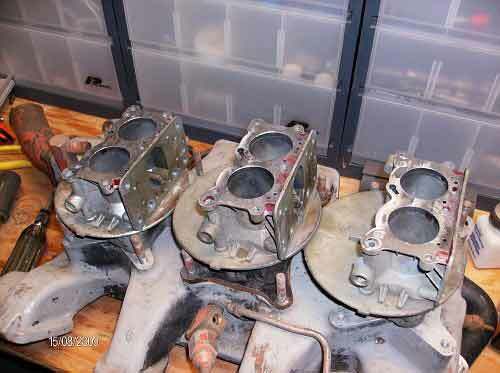 The back side of each carburetor did not sit flush to the throttle plate. 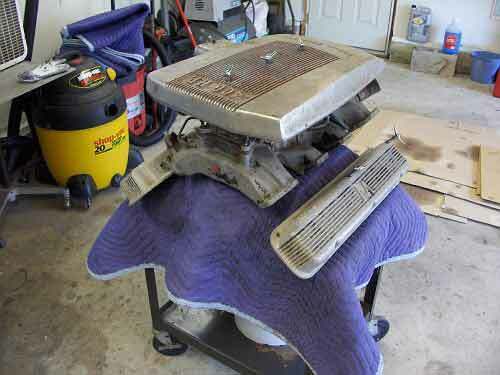 If this surface does not bolt up flush with the throttle plate you have an instant vacuum leak. One unit had to be milled 18 thousandths to get the surface true. 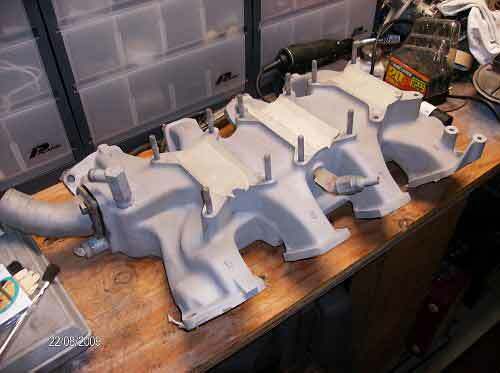 The bottom of each unit was warped very badly causing a rough idle condition…..
A bad or weak casting can give you some real headaches. 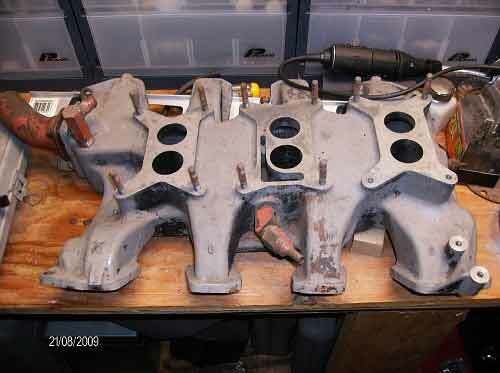 Ok .....Lets "Prep the intake manifold. I used a spray on paint remover for the first step. Then a quick bath to nutralize everything. Next a little Media Blast to get a uniform texture.